This clinic is a live, one-day training that is available onsite, live stream or via webinar replay. Those who attend the on-site training will be provided a boxed lunch. The Proposal and Certification Repair Clinic is specifically designed to help companies that have previously submitted unsuccessful proposals and or certifications find out what went wrong in their proposals and how to fix it. Bring your questions, concerns, rejected proposals, and roadblocks to this live clinic and get real-time strategies to help you write better proposals and win more contracts. 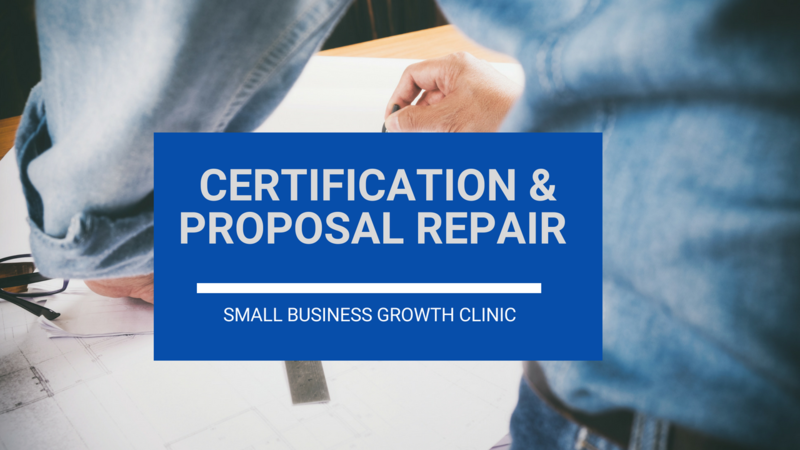 Our Proposal Repair Clinic is where you come to solve your business problems. We're not talking about buying workbooks and working on hypothetical business problems that may or may not relate to your business. The Business Building Clinic will help you find solutions and workarounds for your business challenges in real-time. To register for the Proposal Repair Clinic, click here. Registration is limited to 10 companies.